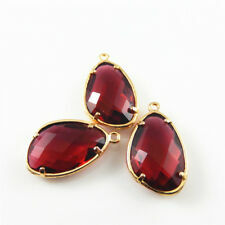 Detailed Size:24mm(Length)×12mm(Width). The cute little glass bottles are perfect for various crafts. 10pcs bottles. We will reply you ASAP. Besides, it is suitable for decoration or send as gift to friends. 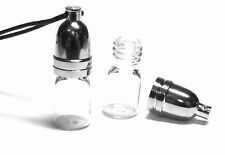 - Pure handcraft clear glass bottles, each bottle with a cork plug. 10 Love Heart Shape Mini Wish Note Craft Glass Bottles Jars with Cork (Clear). We also can source many products for you. Pure hand-made clear glass bottles, each bottle with cork. insert into bottles, DIY as necklace pendants. Material: glass wood. Color / main color: transparent. Color : Multicolor. Glass Bottle. Wish Bottle. Material : Glass Resin. Check out this item at ". 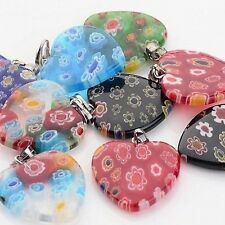 Quantity: 10 pcsMaterial: GlassCute glass bottles which can be used variety of styles or designsMultifunctional, can fill with potpourri, jelly balls, acrylic rocks and gemstones, flower petals, and decorate with ribbon, or simply fill with sandyGood to DIY it as necklace pendant, drift wishing bottles or perfume bottles, also suitable for decoration or send as gift to friendsColor: ClearPattern: Flat bulbBottle height: Approx 2cm / 0.8 inchBottom diameter: Approx 1.2cm / 0.5 inchCork height: Approx 1cm / 0.4 inchPackage Includes:10 x Mini bottlesNote:Light shooting and different displays may cause the color of the item in the picture a little different from the real thing. The measurement allowed error is /- 1-3 cm. MPN Does not. 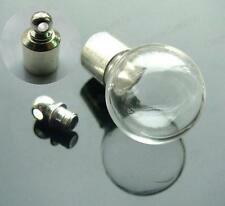 Detailed Size:24mm(Length)×12mm(Width). The cute little glass bottles are perfect for various crafts. 10pcs bottles. 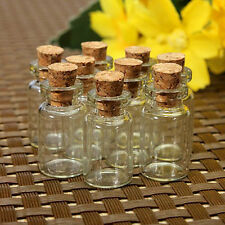 Mini Glass Jars Wishing Bottles Vials with Cork Stoppers Wedding Favours 10Pcs (Heart Shape). Pure handcraft clear glass bottles, each bottle with a cork plug. Multifunctional, can fill with potpourri, jelly balls, acrylic rocks and gemstones, flower petals, and decorate with ribbon, or simply fill with sandy. APPLY: Cute glass bottles which can be used variety of styles or designs. Material: Glass. Color: Transparent. Due to the difference between different monitors, the picture may not reflect the actual color of the item. Color :Mixed. Material : Glass. Better Service, High Quality, Highly Cost Effective, Factory Price . (like B12345)marked on the parcel you received ,we will sort it out. Due to the difference between different monitors, the picture may not reflect the actual color of the item. Butterfly Electroplated Glass Pendants, Silver Plated Bottom, Faceted, Colorful. Colour Colorful. Glass pendant looks shining and fascinating. The back of the pendant has been plated silver color. Match them with cords into beautiful necklaces, they will be charming jewelry. Multifunctional, can fill with potpourri, jelly balls, acrylic rocks and gemstones, flower petals, and decorate with ribbon, or simply fill with sandy. Cute glass bottles which can be used variety of styles or designs. 6 x Mini glass jars. Diamater 25x27x4mm MAX SIZE. RANDOM COLOURS AS SHOWN. 3 X HEARTS PER ORDER RANDOM COLOURS. HEART SHAPED SHAMBALLA BEADS! The cute little glass bottles are perfect for various crafts. 10pcs bottles. Hand Made Guardian Angel Pendants. Color : Baby Blue. Size : Size:3cmx1.8cm. Hole Size:2mm. Note : Hole size: 2mm. There is a 1.5mm hold in the top of the screw for attaching as a charm or pendant. 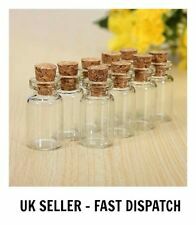 10pcs Glass Globe Vials. You will received 10pcs. More empty bottles available! Droplet Shape Natural Dried Flower Glass Pendants. Material : Glass. Color : Green. Condition : 100% New. Check out this item at ". 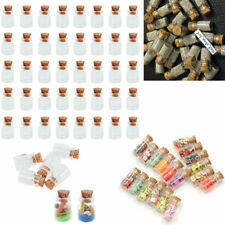 : B87156 F.
The cute little glass bottles are perfect for various crafts. 10pcs bottles. GBP 1.91 18 sold. GBP 1.09 25 sold. GBP 1.29 14 sold. GBP 1.81 0 sold. Color: Transparent. Material: glass. Note:Light shooting and different displays may cause the color of the item in the picture a little different from the real thing. hole : 5.5 mm. Really handy for the common life.